What is Groton Bank? Where is Groton Bank? What happened in Groton Bank? Who lived in Groton Bank? What is Groton Bank? Groton Bank is a historic village on the east bank of the Thames River in Groton, Connecticut. Geographically it comprises less that a half square mile--about 1 % of the Town of Groton and about 10% of the Town's major subdivision, the City of Groton. Today the Groton Bank neighborhood contains a few hundred houses, three churches, a library, two museums, a Revolutionary War fort and business structures dating primarily from Colonial times to a century ago. Groton Bank and Fort Griswold are separate but adjacent Historic Districts listed on the U.S. Department of the Interior's National Register of Historic Places. In 1655 the ferry operator Cary Latham became the first permanent English settler on the east bank of the Thames River when it was part of the Pequot Colony, later to become New London. 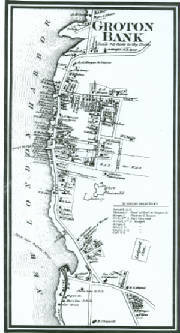 After Groton became a separate town in 1705 the east bank of the river became known as Groton Bank and grew to become a major village in the town. In centuries following, Groton Bank became a national and world leader in shipbuilding, site of the only major Revolutionary War battle in Connecticut (Sept. 6, 1781), active in West Indies trade, the key defense (Fort Griswold) of the Thames Harbor and Connecticut in the War of 1812, a transportation hub, the town’s early center of business and commerce, home to the most famous captains of the whaling era as well as other prominent sea captains, and the residence of many leading citizens including a congressman. Early Groton Bank history is intertwined with New London’s—many famous whaling captains and others sailing from New London harbor and a number of New London’s prominent businessmen resided at Groton Bank. Beginning in 1881 part of Groton Bank began to take on the name Groton Heights in honor of the 100th anniversary of the Revolutionary War Battle of Groton Heights fought here on September 6, 1781. In 1903 Groton Bank’s progressive residents were key to establishing the much geographically larger Borough of Groton, now the City of Groton and use of the name Groton Bank declined until 1970 when residents founded the Groton Bank Historical Association and began to revive the area and it history. Today Groton Bank retains its village character of earlier times with a spectrum of village architectural styles including Colonial; Federal; Greek Revival; Victorian with its sub-styles of Italianate, Mansard, Carpenter Gothic, Stick style, Queen Anne, and Cottage style; Shingle style; Old English; English Tudor; Romanesque; and Neo-classical—all in an area of only about a dozen square blocks. Many of these structures retain their original appearance. Since Groton Bank’s 19th century residents were prosperous some of them enlarged or added “modern” features to their earlier era houses. For example, some colonial and Greek Revival houses have later additions or embellishments such as Victorian bay windows or porches. Examples of the architectural styles at Groton Bank are noted in photos below. Please continue here to view the many different architectural designs found in Groton Bank.